Vynova Wilhelmshaven features one of Europe’s largest plants for the production of suspension PVC (S-PVC), a high-quality material that our customers convert into a wide range of products for daily life. In addition, we produce vinyl chloride monomer (VCM), an essential building block to make PVC. Situated on the western side of the Jade Bight, a bay of the North Sea, the Wilhelmshaven site has direct access to Germany's only deep-water port. The site boasts excellent infrastructure for the import and export of ethylene dichloride (EDC), ethylene and VCM. 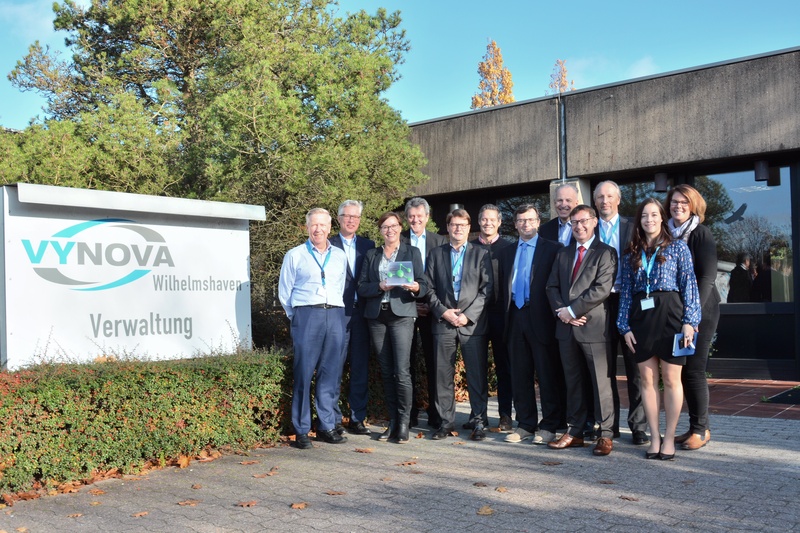 Wilhelmshaven receives, for example, EDC shipments from the Vynova sites in Runcorn (UK) and Tessenderlo (Belgium). With more than 380 employees, Vynova Wilhelmshaven features among the most prominent employers in the region. Although Vynova itself is a young company, the history of the Wilhelmshaven site dates back more than 35 years. Discover the most important milestones in our history further down this page. As a responsible manufacturer, Vynova Wilhelmshaven is certified for the ISO 9001 quality management standards, the ISO 14001 standards for environmental management and the ISO 50001 energy management system standards. The site is acquired by International Chemical Investors Group (ICIG). Vynova is founded. The new company comprises the Wilhelmshaven site as well as sites in Tessenderlo (Belgium), Mazingarbe (France), Beek (the Netherlands), Runcorn (UK) and an affiliated site of ICIG in Thann (France). The Wilhelmshaven site is renamed Vinyls Wilhelmshaven GmbH. Chlorine production at the plant in Rüstersiel is shut down under parent company INEOS. EVC Deutschland GmbH is renamed INEOS Vinyls Deutschland GmbH. INEOS acquires the chlorine plant from Imperial Chemical Industries (ICI) and the VCM and PVC plants from European Vinyls Corporation (EVC). The European Vinyls Corporation (EVC) is formed in a joint venture between ICI and Enichem. The Wilhelmshaven VCM and PVC plants had since then been producing on behalf of the German daughter company EVC Deutschland GmbH. Commissioning of the new VCM and PVC plant located in Voslapper Groden. ICI begins construction of a VCM and PVC plant in the Wilhelmshaven district of Voslapper Groden. Imperial Chemical Industries (ICI) acquires a chlorine plant in the Wilhelmshaven district of Rüstersiel from Alusuisse. Discover the latest news from our Wilhelmshaven site via the button below. Vynova Wilhelmshaven operates with respect towards the environment and with consideration towards the health of our employees and communities by implementing safe manufacturing processes. Our commitment to quality, safety and environmental accountability is summed up in the Vynova Safety, Health, Environment and Quality (SHEQ) policy, which you can consult on the dedicated page. Other documentation for contractors and suppliers can be found in the section below. Are you a contractor or supplier for Vynova Wilhelmshaven? Here you will find useful documents and guidelines. Also, please regard the safety-related documentation included in our Safety, Health, Environment and Quality (SHEQ) section above. At Vynova Wilhelmshaven, we value the commitment of our employees and the vital role they play in our success. We invite you to discover the different job opportunities at our site via the button below. If there are no vacancies published at the moment, you can submit a spontaneous application. DO YOU HAVE ANY QUESTIONS ABOUT VYNOVA WILHELMSHAVEN?